Taos was New Mexico's premier art colony and the first significant art colony in the American West. 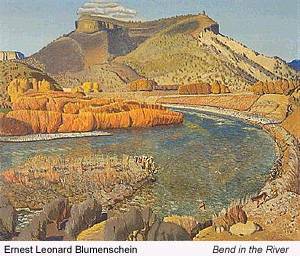 Founders were Ernest Blumenschein and Bert Phillips who were on a painting expedition together when their carriage broke down in the vicinity of Taos in 1898. Awed by the beauty of the Sangre de Cristo mountain range and intrigued by the mix of Taos Pueblo Indian and Hispanic cultures, they spread the word. 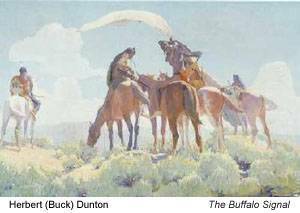 The earliest born of AskART's listed artists who painted in New Mexico before 1940 was New Mexico painter Jose Rafael Aragon, 1795-1852, a Colonial Folk artist from Spain who settled in New Mexico. Among that early group were U.S. government explorer artists such as Henry Cheever Pratt, John Russell Bartlett, and John Mix Stanley. Many of the artists who painted in Taos before 1940 had studied in Paris before 1900: The list includes Mathias Alten, Ernest Blumenschein, Colin Campbell Cooper, Emma Lampert Cooper, Eanger Couse, Catharine Critcher, Leon Gaspard, John Hauser Jr, Robert Henri, Joseph Imhof, William Leigh, Bert Geer Phillips, Henry Rankin Poore, Frederic Remington, Julius Rolshoven, Joseph Sharp, and Theodore Wores. In Paris, Blumenschein, Couse, and Sharp were honored with acceptance of their work in the Salon exhibitions. Others such as Walter Ufer, Nicolai Fechin, Leon Gaspard, and Augustus Dunbier had been trained in other European academies including in Germany and Russia. The first generation of artists, 1885 to 1915, in addition to Blumenschein and Phillips included Oscar Berninghaus, E. Irving Couse, Buck Dunton, Victor Higgins, Walter Ufer, Julius Rolshoven and E Martin Hennings. Many of them knew each other from the Art Institute of Chicago and were sponsored by Carter Harrison, Mayor of Chicago, who, in turn, wanted paintings of Southwest subject matter. This first generation of artists generally painted in conservative, realist styles taught at the academies. In 1915, six of them formed a group called The Taos Society of Artists whose purpose was to have strength in numbers to market their paintings in the East. Over the next dozen years, the organization added more members and became one of the best known and most colorful art colonies in America. But it did not hold together because of the independent personalities of its members. In this regard, their chief sponsor was the Santa Fe Railroad, whose officials purchased many of the paintings and used reproductions on promotional pieces to lure travelers to the West via the Santa Fe. Although the stylistic distinctions between them and the earlier group are blurred, a second generation of arriving artists in Taos are often described as being more modernist in style, many of them having been influenced by impressionism and other movements originating in Europe. This second generation included Georgia O'Keeffe, Andrew Dasburg, Marsden Hartley, John Marin, John Sloan, and Robert Henri, who became an associate member of the Taos Society. A key figure in bringing this second group of artists to Taos was Mabel Dodge, a wealthy socialite from New York, who settled in the village, married a Pueblo Indian, and hosted many prominent artists from the East. Other sponsors played key roles in the livelihood of what are now regarded as big- name artists associated with the Taos Art Colony. William Klauer, a businessman of Dubuque, Iowa, was a major supporter of Walter Ufer; Joseph Butler Jr. of Youngstown, Ohio, opened the Butler Institute featuring his collection of many Taos paintings including nearly four dozen canvases he had purchased from Joseph Henry Sharp, mostly Indian portraits; and Nelda and H.J. 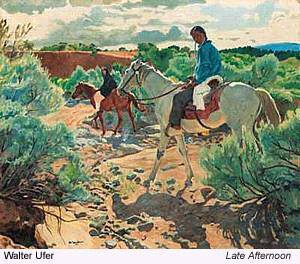 Lutcher Stark built the Stark Museum in their home town of Orange, Texas based on their collection of Taos paintings from their travels beginning in the 1930s. The Taos artist colony ebbed with World War II, which diverted the resources of the Santa Fe Railroad as well as many collector-benefactors and general tourists. Then post-war Abstract Expressionism and other abstract "isms" pushed much of the art that had any recognizable subject matter or obvious geographical roots under the rug to be replaced by "psyche-scapes" (our word) rather than "scapes" of sun setting on mesas or Indian pueblos. But in the last few years, those Taos painters, the ones we hear the most about, are part of the cream that is again rising to the top of that great mix called American art. At the top of the Taos heavy hitters' list, both residents and visitors, relative to prices realized at auction are Georgia O'Keeffe, Frederic Remington, John Sloan, Marsden Hartley, E Martin Hennings and Walter Ufer.